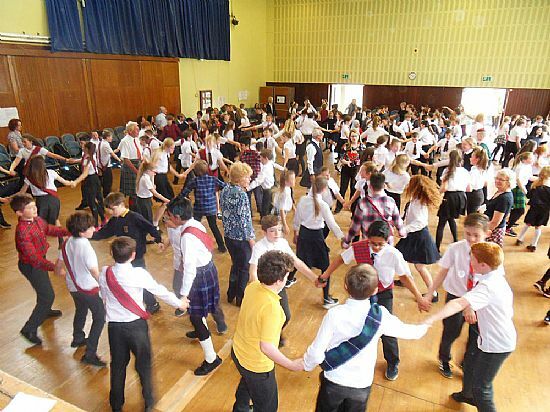 RSCDS Glasgow Branch is involved with activities to encourage children and young adults to enjoy Scottish Country Dancing. Branch members are happy to provide advice and help. Some of these activites are described below. 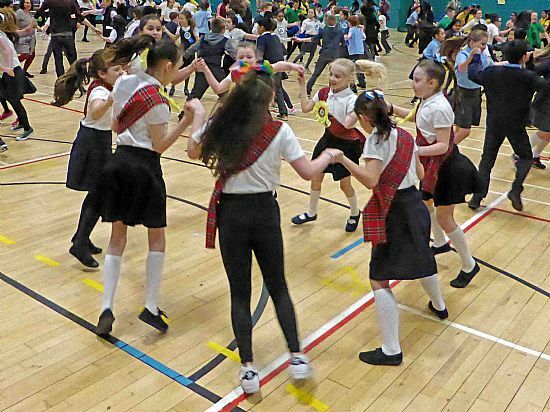 The Primary Schools 'Day of Dance' is a one day event for Scottish Country Dancing held each year in mid-March, the next event is March 2020. This is organised jointly by staff from the Glasgow Education PE Department together with a team from RSCDS Glasgow Branch. 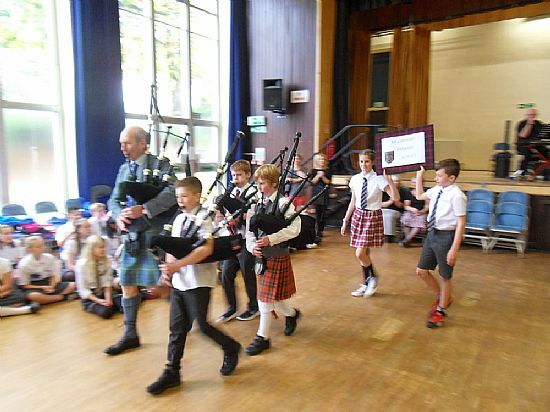 Some Primary schools in Glasgow have a Scottish Country Dancing activity as part of the Expressive Arts curriculum. This Day of Dance gives the children an opportunity to display their skills. Schools which decide to take part are given a resource pack which includes a DVD of the dances see video on our Facebook page. The children usually learn about 6 dances. RSCDS teachers may be able to visit and help teachers with the dances, if requested. There are a number of ways schools may take part in this event – please get in touch if you are interested. 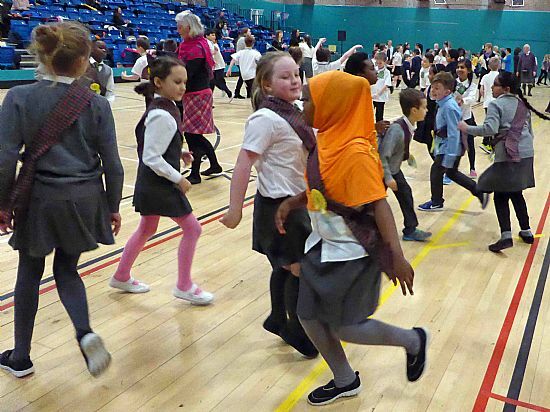 On Wednesday 13th March 2019 the Bellahouston Sports Hall was once again filled with almost 500 excited youngsters from over 20 Glasgow Primary Schools. There was a buzz of energy and enthusiasm for the dancing, especially the Flying Scotsman Jig and the Dashing White Sergeant. We had Walter Provan as our experienced MC and excellent music from John Carmichael and his band. What a super day to watch the children from the various schools. Thank you to all Branch members and Glasgow Education staff who helped make this event happen. Let’s hope that amongst these children are some of our future dancers. Glasgow Music Festival is now in its 107th year and aims to provide 'a platform for performance'. 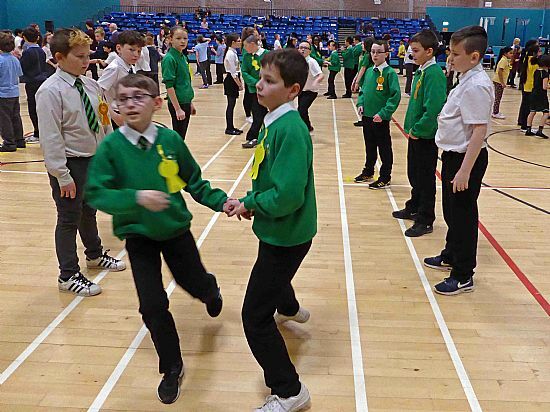 It enables teams from schools and youth groups from in and around Glasgow to compete and receive adjudication on their Scottish Country Dancing performances. (www.glasgowmusicfestival.org). The dance events for Glasgow Music Festival took place this year on Friday 8 March 2019 this year. 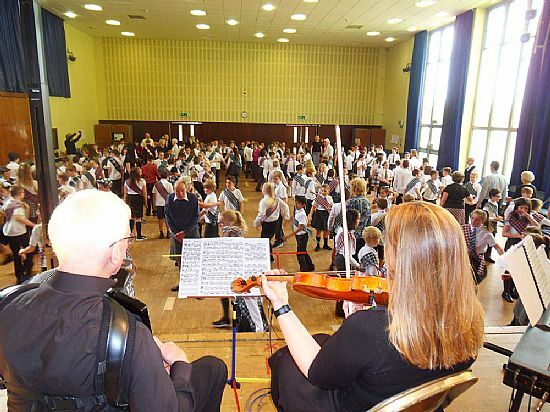 They were held in the Blythswood Hall at Renfield St Stephen's Church Centre with school groups participating in the morning and classes for youth groups and dance organisations taking place in the evening. We welcomed over 100 dancers ranging in age from seven to adult who participated in a variety of competitive and non-competitive classes. The adjudicator was Jimmie Hill and Màrtainn Skene provided the music. In the schools categories both sets from St Ninians Primary gave very nice performances. Camstradden Primary attended for the first time and performed with real enthusiasm. Their very young team came first equal in Class 504. St Leonards Primary brought a large contingent of proficient dancers again this year and was successful in both the competitive and non-competitive classes. St Leonards Primary 7a were awarded the Marion B Hamilton Certificate. Thanks are due to Jimmie and Màrtainn for all their work, also to Maureen Daniel who acted as scribe and to everyone who came along to help as stewards on the day. The Scottish Country Dancing events are presented in association with the Glasgow Branch of the Royal Scottish Country Dance Society. 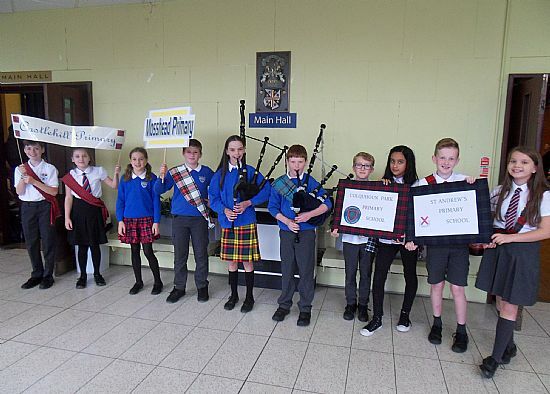 The dances performed by school groups were aligned with these for the Glasgow Primary Schools Festival in a bid encourage participation in both festivals. However some schools still seem to participate in one festival or the other. The next event takes place in March 2020. Each year a new syllabus is published - highlighting the options for the year. Do get in touch if you are interested. see www.rscds.org/article/jigs-reels An example dance on Facebook is available to view, click here. 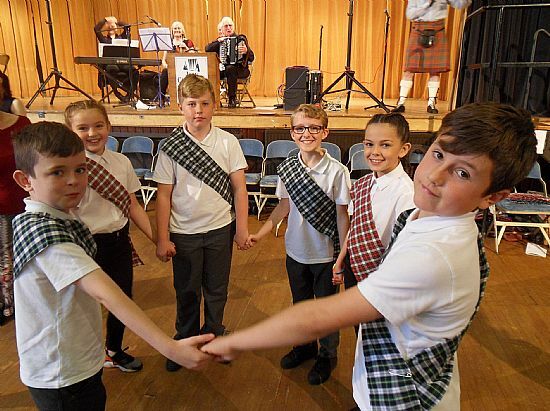 The Bearsden & Milngavie Festival held on 5th October 2018 reached its sixth birthday with around 400 children from Bearsden and Milngavie Primary Schools, dancing the day away. The event was officially opened by the Depute Provost Gary Pews, who, in addition to congratulating the children on a resplendent turnout, was inspired by the spectacle in fornt of him. 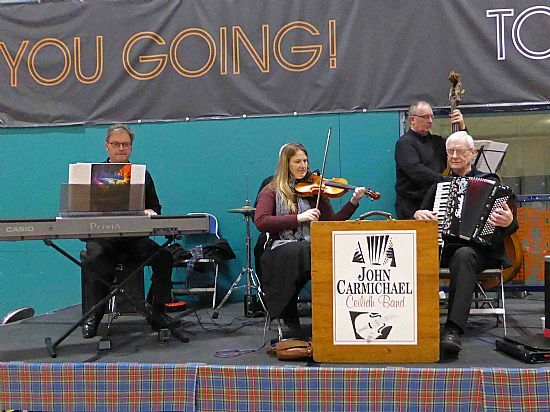 John Carmichael and the band then struck up to the beat of Jigs and Reels resonating around the hall accompanying a programme of communal dances such as the Virginia Reel, Dashing White Sergeant, Flying Scotsman etc. and with each school giving a performance of two specialist dances. This community event is initiated by New Kilpatrick Parish Church and organised by Walter Proven and members of the independent NK SCD Club. The Festival receives financial support from the RSCDS Glasgow Branch, with the current Chairman mentioning how keen we are on encouraging young dancers and this type of event epitomises their efforts. The event was the culmination of weeks of training within the schools by Walter and other members of his team. Most of the children learning completely from scratch the social skills of Scottish Country Dancing. It was wonderful to see so many happy faces on the day as the youngsters enjoyed taking part in the event!! The children bounced out of the hall at the end of the day with the music still ringing in their ears.